Relays are electromechanical switches, used to control the several circuits by using low-power signal or one signal. These are found in all sorts of devices. 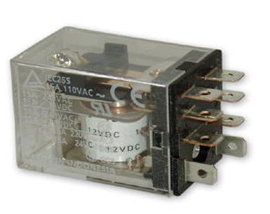 Relays allow one circuit to switch a second circuit which can be completely separate from the first. There is no electrical connection inside the relay between the two circuits; the link is magnetic and mechanical only. Basically a Relay consists of an electromagnet, an armature, a spring and a series of electrical contacts. The electromagnet coil gets power through a switch or a relay driver and causes the armature to get connected such that the load gets the power supply. The armature movement is done using a spring. Thus the relay consists of two separate electrical circuits which are connected to each other only through magnetic connection and the relay is controlled by controlling the switching of the electromagnet. Current moving through the coil of the relay makes a magnetic field which attracts a lever and changes the switch contacts. The loop or coil current can be on or off so relays have two switch positions and generally have double throw (changeover) switch contacts. Relays are usually SPDT or DPDT however they can have numerous sets of switch contacts. The contacts are usually common (COM), normally open (NO) and normally closed (NC). The normally closed contact will be connected to the common contact when no power is applied to the coil. The normally open contact will be open when the no power is applied to the coil. 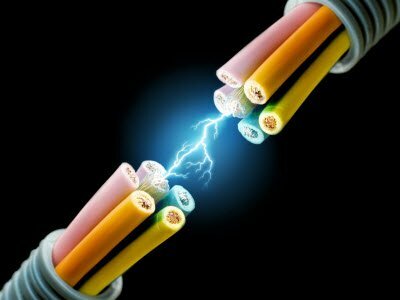 When the coil is energized the common is connected to the normally open contact and the normally closed contact is left floating. The double pole versions are the same as the single pole version except there are two switches that open and close together. Current flowing in the disk maintains magnetic field for a short time. For a slightly longer delay, a dashpot is used. A dashpot is a piston filled with fluid that is allowed to escape slowly. The time period can be varied by increasing or decreasing the flow rate. For longer time periods, a mechanical clockwork timer is installed. From the circuit, relay-1 and relay-2 the contacts of which are connected in series with relay-3 coils, to the first dc supply. Relay-3 switches ON only if relay 1 and 2 are ON meaning supply at R, Y and B are available. The output contacts of relay-3 are fed to relay-4 Q1, NC contacts both of which are 3-Co relays. Thus the R, Y, B fed to relay-3 reaches NO contacts of relay-4. All the NO contacts of relay-4 are joined together to develop a star-mode configuration to the motor connection coil U1-U2, V1-V2, W1-W2. While relay-4 is switched ON by the timer IC; after main supply switch ON taking a time delay, the contacts of relay-4 bring the motor connections to delta mode by the NC contacts duly wired. Single phasing meaning any one or two phases Y and B missing bring either relay-1 or relay-2 to off condition that results in relay-3 to switch OFF. Thus relay-3switch off prevents the input 3-phase to reach the motor supply to protect the same for single phasing. Relay with latching construction composed of 2 coils: set coil and reset coil. The relay is set or reset by alternately applying pulse signals of the same polarity. 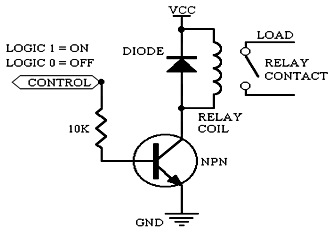 From the circuit, relay is used which is driven by a transistor from port pin number10. The contacts of the relay are interfaced to a land line telephone connection. The output of which is super imposed on the telephone lines through only if the relay1 is ON. The relay operates (with an led indication L2) from pin number 10 through Q2 transistor before dialing data reaches the encoder from the MC. The dialing continues till dialed number party lifts the receiver or otherwise it automatically switches of the relay after 3 minutes to force hand set to virtual “On the hook” condition. Relay with latching construction that can maintain on or off state with a pulse input. 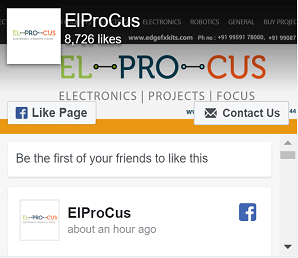 With one coil, the relay is set or reset by applying signals of opposite polarities. In this we are going to see a relay with 1 coil using ULN2003. 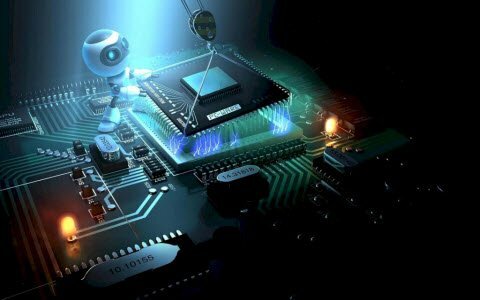 ULN2003 is an IC which is used to interface relay with the microcontroller since the output of the micro controller is maximum 5V with too little current delivery and is not practicable to operate a relay with that voltage. ULN2003 is a relay driver IC consisting of a set of Darlington transistors. If logic high is given to the IC as input then its output will be logic low but not the vice versa. Here in ULN2003 pins 1 to 7 are IC inputs and 10 to 16 are IC outputs. If logic 1 is given to its pin1 the corresponding pin 16 goes low. If a relay coil is connected from positive to the output pin of the IC then the relay contacts change their position from normally open (NO) to normally close (NC) then the light will glow. If logic 0 is given at the input the relay switches off. Similarly up to seven relays can be used for seven different loads to be switched on by the normally open (NO) contact or switched off by the normally closed contact (NC) but in this we used only one relay for operation. One of the simplest ways is using a timer to control the switching of the relay.Here a simple circuit is developed, which can switch on / off a load when the set time arrives. It can be used to switch on AC loads such as TV, Radio, Music system etc. Its triggering pulse is obtained from a small table clock. The clock alarm timing is set to manually control the switch on/off. 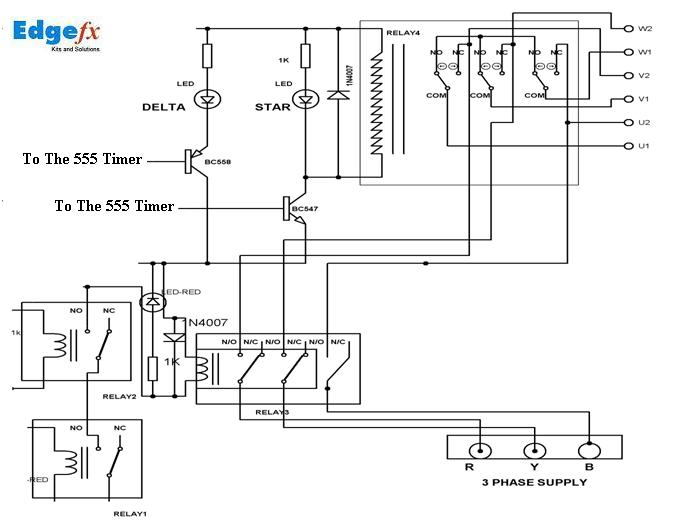 Basic idea is to control the relay switching by controlling the triggering of SCR through the Optocoupler which is in turn triggered by the clock alarm. An SCR to trigger the relay. 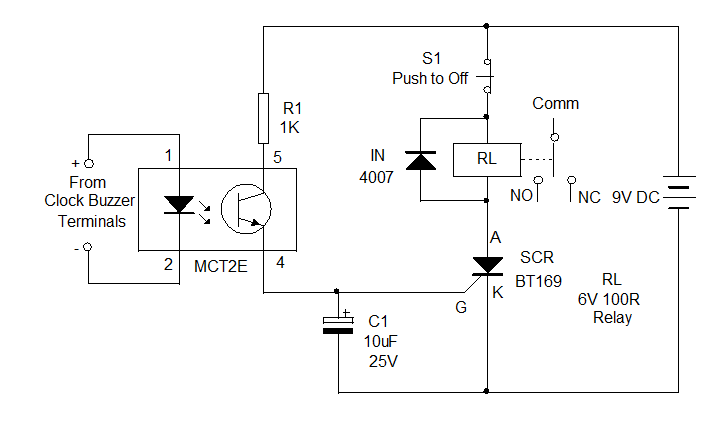 The clock output is given to the circuit using an Optocoupler IC MCT2E. The alarm buzzer gets around 3 volts when the alarm rings. The Optocoupler is triggered with this voltage. The Optocoupler has an LED and phototransistor inside. 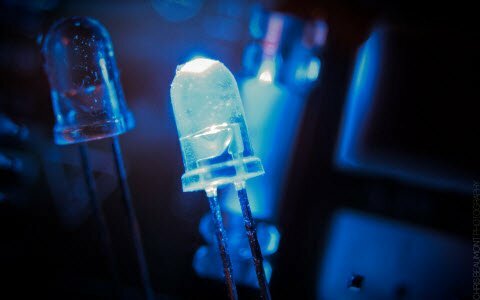 When the LED inside the Optocoupler lights by receiving an external voltage, the phototransistor conducts. 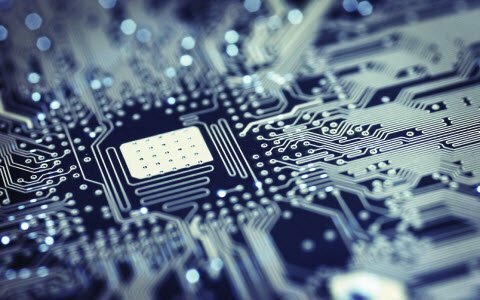 When the Phototransistor conducts, the SCR BT169 fires and latches. This actuates the relay and the load will switch on / off. If the load is connected through the common and NO contacts, the load switches on. The load switches off if it is connected through the common and NC contacts. The SCR starts conducting when a triggering pulse is applied to the gate terminal. The SCR continues the conduction even if the gate pulse is removed. It can be switched off only by removing the anode current. So a Push to off switch S1 is used to reset the SCR. Capacitor C1 has a buffering action at the gate of SCR for its smooth working. Diode IN4007 protects the SCR from back emf. The table clock used is the low cost one. Open its back cover and solder two thin wires at the buzzer terminals and connect to the pins 1 and 2 of the Optocoupler observing polarity. 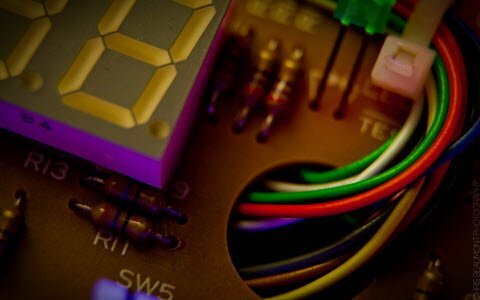 Enclose the circuit with the power supply in a case and fix the clock above it using glue. To connect the load, an AC socket can be fixed on the box. A relay can also be controlled using a relay driver IC ULN2003 which is interfaced to a microcontroller and drives the relay based on the signals from the Microcontroller. It is a high voltage IC consisting of 7 Darlington pairs of transistors. It is basically a 16 pin IC. It consists of 7 input pins and 7 corresponding output pins. The relay driver can drive upto 7 relays with each relay connected to each of the 7 outputs. The input pins of the relay are connected to the I/O pins of the Microcontroller. Here only one relay is shown for demonstration purpose. The relay as well as the relay driver requires a power supply of 12 V at pin 9. The operation is similar to an inverter where a logic low input results in a logic high output. The load is connected to the normally open contact. When a logic zero is applied to one of the input pin of the relay driver, a logic high output is developed across the corresponding output pin. 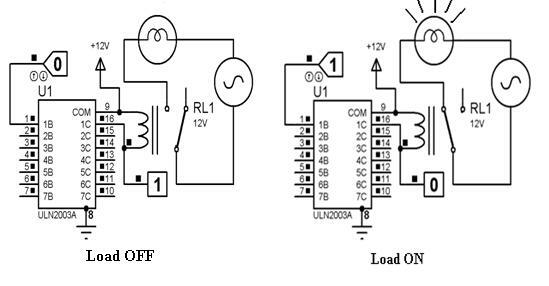 Since the relay is connected to almost same voltage at both of the end points, no current flows and the relay is not energized. Incase of a high logic at the input pin, the output pin gets a low logic signal and due to a potential difference, a current flows and the relay coil gets energized such that it causes the armature to move from the normally closed position to the normally open position , thus completing the circuit and causing the lamp to glow.